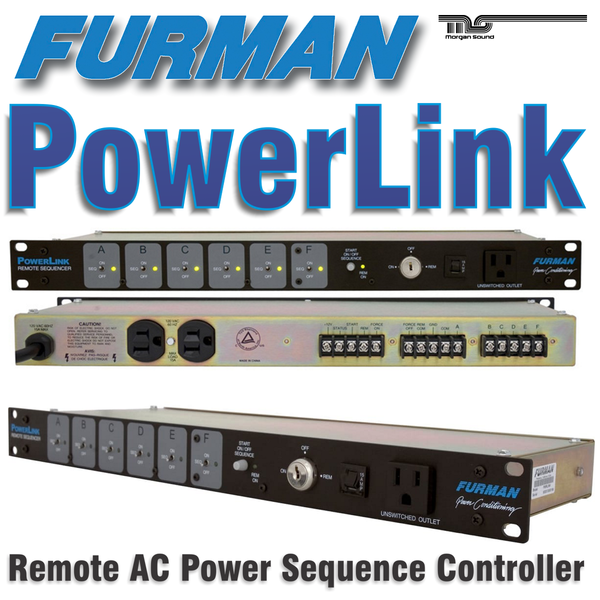 The Furman PowerLink Remote AC Power Sequencer allows you to trigger 6 power control devices in a sequenced fashion. All outputs are electrically isolated, normally closed or normally open low-power relay contacts. Each control output has a front-panel status indicator, and has a 3-position switch allowing it to be part of the sequence, or to be switched on or off independent of the sequence. The delay interval between the turn-on or turn-off of each device and the next in sequence is user-adjustable via an internal trimpot. 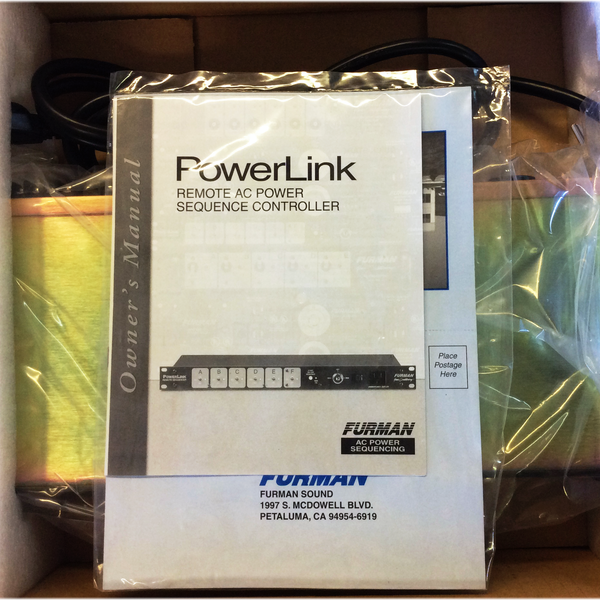 A PowerLink is intended to work with a group of relay controlled power outlets such as the Furman MiniPort-15 and MiniPort-20, to create a very flexible power control system that can expand to handle as many circuits as needed. The outputs of the PowerLink are low power relay contacts, accessible through rear-panel screw terminal strips. Outputs may be configured to be normally closed or normally open by internal jumpers. All input and output commons are electrically isolated to avoid the creation of ground loops. Common isolated from chassis and control ground. 130 VAC max from relay common to chassis. Relay can switch 1/2 amp max @ 125 VAC, or 1/2 amp max @ 24 VDC. Construction: Steel chassis, zinc chromate plating; .125” brushed and black anodized aluminum front panel.